Seeing blood in your urine can be frightening. Yet, blood in the urine isn't always a matter of concern. For instance, strenuous exercise can cause blood in urine as well as a number of common drugs such as aspirin. But, urinary bleeding can indicate a serious disorder. There are two types of blood in the urine. 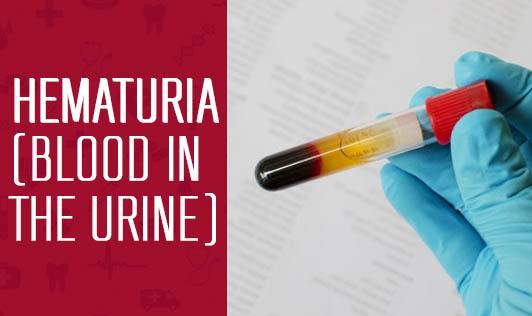 Blood that you can see - gross Hematuria and urinary blood that is visible only under a microscope - microscopic Hematuria, which can be found only when your doctor tests your urine. Either way, it is vital to find out the reason for bleeding. • Bladder cancer: Quit smoking, avoid exposure to chemicals and drink plenty of water. This can cut your risk of bladder cancer. • Urinary tract infections: Drink plenty of water, avoid irritating feminine hygiene products, and urinate whenever you feel the urge as this may reduce your risk of urinary tract infections. • Kidney cancer: To help prevent kidney cancer, you should stop smoking, maintain a healthy weight, stay active and avoid exposure to toxic chemicals. Although most cases of Hematuria aren't serious, it is important to contact your doctor anytime you notice blood in your urine!